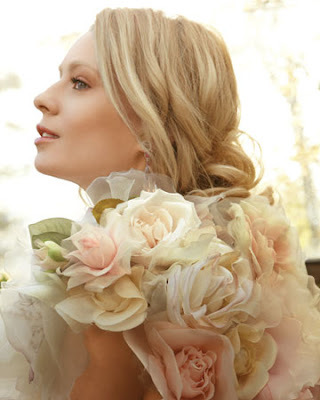 This seasons's crop of wedding gowns need only you dear bride to spring to life! A floaty chiffon dress embellished with windblown floral appliques by Kevan Hall and pastel floral drop bolero from Claire Pettibone. Divine floral appliques on a silk faille gown from Oscar de la Renta and sumptuous cut organza reminiscent of a freshly opened rose from Vera Wang. Douglas Hannant's dramatic trumpet shape and Pronovias' floaty ruffles. Pleated petal organza by Marchesa. For more gowns, click here! I'm shocked that I'm a bit fascinated by that bolero. I keep going back to it and would love to see the entire piece. Oh wow, they look like flowers themselves. Gorgeous!